It’s been a while since my last post so sorry about that! I haven’t abandoned my blog and I have actually had the first part of this post written for over a week but then I decided I needed to buy another bottle to finish the review (excuses). Also, I have spent a rather alcoholic weekend in the beautiful city of Chester for a friend’s hen do. If you love beer by the way, Chester is crammed with real ale pubs. Even the hotel I was in, The Mill, had a real ale pub with 10 rotating guests! So now I have sobered up, I’d like to tell you about two beers from the amazing Struise Brouwers. Over a decade ago, two Flemish ostrich farmers had a crazy notion that they would start brewing beers for their guest house. Now I would never be one to turn down a juicy ostrich steak, but my goodness, I’m glad they branched out into beer! Since humble beginnings producing regional beers with the aid of a local wine maker back in 2001, De Struise Brouwers now have their own microbrewery and have received numerous accolades including the honor of 2008 ‘Best brewers in the world’ as voted for by readers on Rate Beer. Amongst their line-up proudly stands Black Albert (13%ABV). Described as a “Belgian Royal Stout” and made with ingredients of only Belgian origin, this noble beast was named for the Belgian King Albert II. 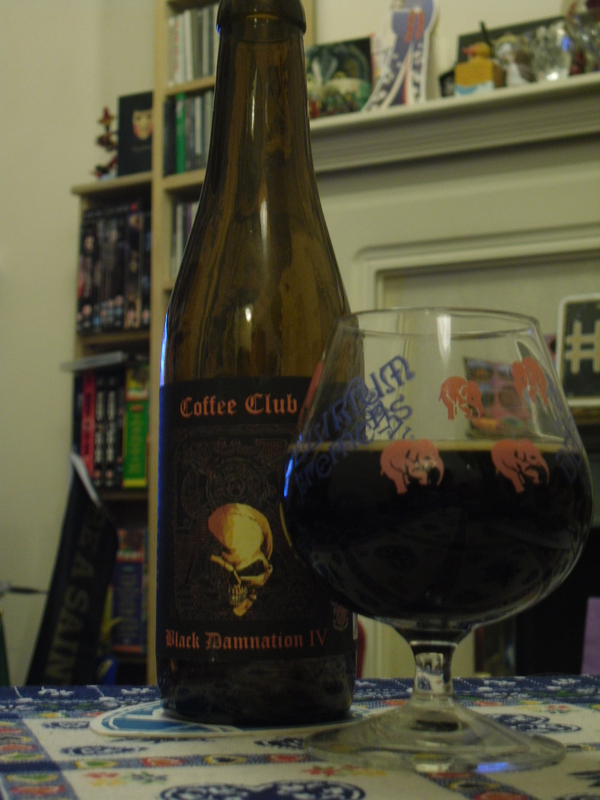 Before I started my beer blog, two of the most memorable bottles the OH had brought back from one of his trips to Brussels were Struise Black Damnation I & II (Mocha Bomb). These stuck in my memory because I absolutely adore the Russian Imperial Stout style and these had some clout and a lot of character. Back then, I hadn’t appreciated that these were the first two of a dozen very special creations spawned from Black Albert. I have now been lucky enough to find Black Damnation IV (13%ABV) right here in Southampton at the lovely Bitter Virtue. IV is the ‘Coffee Club’ edition. To me, ‘Coffee Club’ would make me think of some imaginary sophistocated Al Fresco cafe in Europe where ladies carry dogs in handbags and sip Espresso. This is completely the opposite. The label looks like it’s the kind of beer your mother might have warned you about. A skull grins out from a dark, intricate design which came straight out of the Temple of Doom. The text describes a beer ‘as black as hell, filthy rich in the nose and with a massive taste.’ It shares the first two Black Damnations’ dark, smooth good looks and tight froth cap. What makes this one different is that the Black Albert has been aged for six months in very old rum barrels. The aroma is an intriguingly sweet, malty, rich, dark coffee, like a posh coffee-cream enrobed in a luxurious velvety black chocolate. For a lover of quality espresso, this is pure indulgence. It’s like a thick, warming but naughty bitter-sweet shot of espresso with a little tot of your favorite rum to warm the very depths of the soul. There’s a slight smoke but it’s the rich smoke of very darkly roasted coffee beans, offset by the sweetness of the vanilla. I don’t care if I’m damned – I took a dance with this demon and liked it. So now that I had tried three of the Damnation dozen, I had to try the original, hence why this review was slightly held up! Since I had a long train journey to Chester and needed the company, I took Black Albert (13%ABV) along. A crowded train is always so much nicer with an interesting companion. Out of plastic and on a moving vehicle, the Black Albert poured the same rich, dirty black as the Black Damnation IV, but had a slightly effervescent quality with a dark tan head that disappeared in seconds. Maybe this effervecence enhanced the beautiful, addictive aroma of malt, dark cherries and candy-floss which paved the way for one of the most incredible Stouts I have ever experienced. The flavour was rich, gooey, sumptuous dark chocolate gateaux with some of that candy sweetness shining through, the mouthfeel thick like liquid velvet. Right at the end you get a soft malty fruit cake and you’re left a warming alcoholic satisfaction that feels a little naughty like you’ve been stealing the plump kirch cherries from the top of a black forest trifle. The OH had better leave room in his suitcase next time he goes to Brussels for the other 9 Black Damnations – I need to try them all! Bearded Lady – black magic?